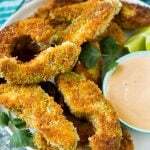 This recipe for avocado fries is slices of avocado that are breaded and lightly fried to crispy golden brown perfection. The ultimate appetizer or side dish for avocado lovers! 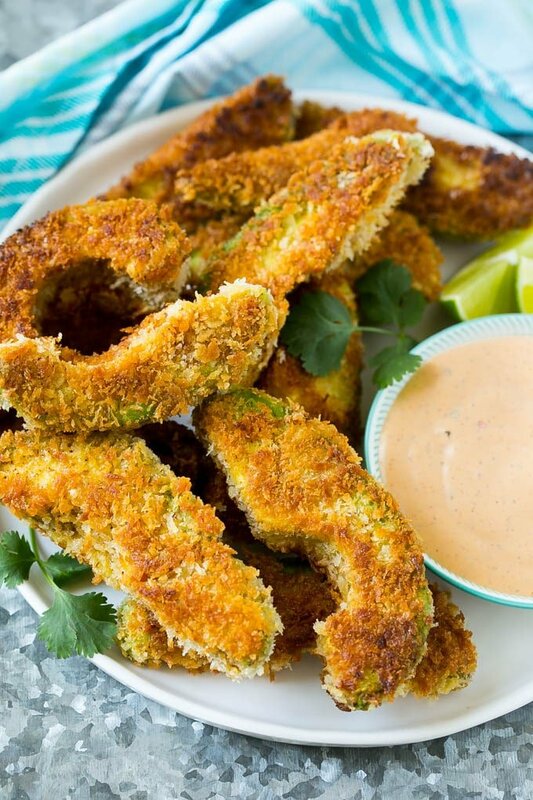 If you’re an avocado fan, you must try these crispy avocado fries. Serve them along with other appetizers such as pizza dip and stuffed mushrooms for an unforgettable party spread! 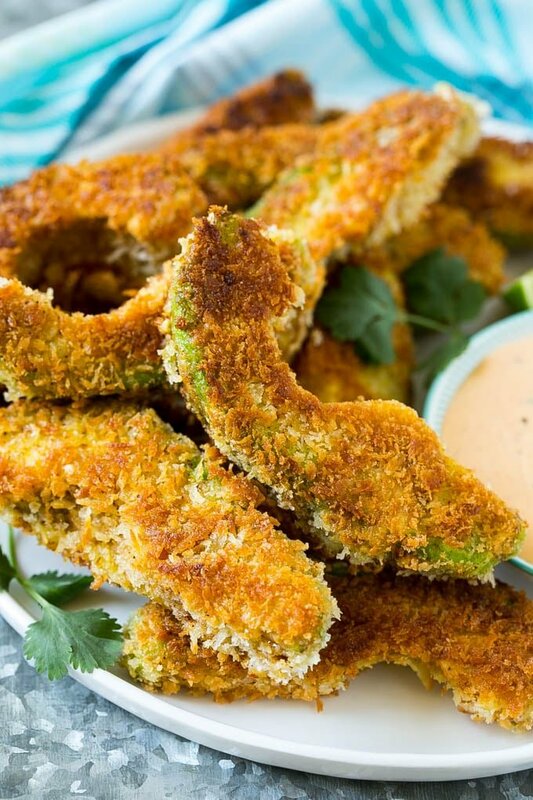 These avocado fries are definitely for people who are huge fans of avocado! They’re super simple to make and are a fun and unexpected party snack. The combination of the creamy avocado and crispy coating can’t be beat! 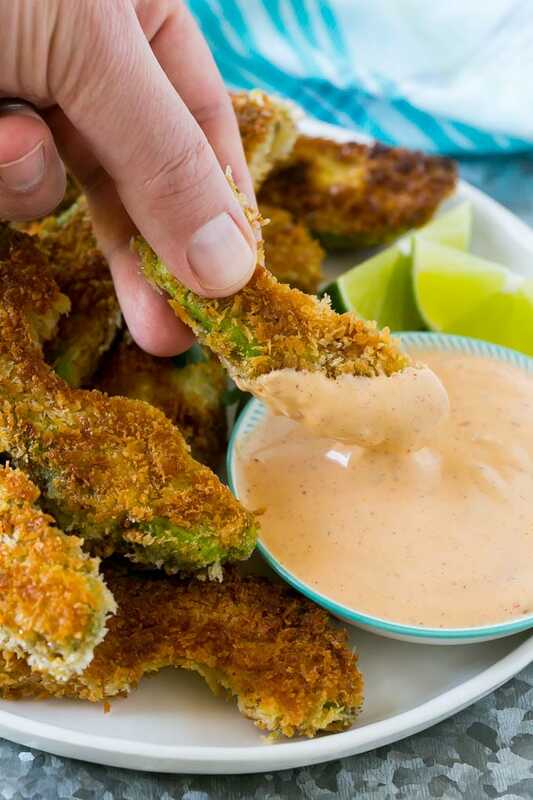 How do you make avocado fries? This recipe starts with a couple of avocados. You want to be sure that you’re using firm avocados here so that they hold up to the breading and frying process. The avocado slices are dredged in seasoned flour, egg and panko breadcrumbs to create an ultra crispy coating. Then the avocado slices are quickly pan fried until browned. You don’t need a lot of oil for this, a 1/4 inch layer of vegetable oil on the bottom of the pan is fine. You’ll need to cook the avocado slices in batches; if you end up with a lot of dark bits at the end of the first few batches, simple wipe out the pan and add a new layer of oil on the bottom. I like to serve my avocado fries with plenty of dipping sauces; in these photos I show the fries with a store bought chili lime ranch. Other great options are salsa (red or green), chipotle mayo, or my creamy cilantro sauce. These avocado fries are best served immediately out of the pan so that they’re hot and crispy. You can add a squeeze of lime juice and a sprinkling of cilantro if you like, or simply serve them as-is and watch them disappear! Peel and seed the avocados and cut them into 1/2 inch slices. In a small bowl, mix together the flour, chili powder and 1 1/2 teaspoons salt. Heat the oil in a large pan over medium-high heat. Add a single layer of avocado slices to the pan. Cook for 2-3 minutes per side or until golden brown. Drain on paper towels. Repeat the cooking process with the remaining avocado slices. Sprinkle the avocado slices with the remaining 1/2 teaspoon of salt and serve immediately, with dipping sauces if desired. Any thoughts on how they would hold up prepared and frozen prior to cooking? 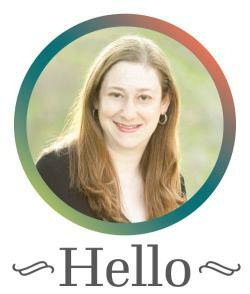 Avocados are on sale right now and I’m looking for ways to use them. You could try frying then, then freezing and then reheating them in an oven until crisp. I do think the avocado may get a little mushy from being in the freezer though. Hope this helps! How would you go about storing and re heating these fries? This recipe is not a good candidate for making in advance, the avocado would brown and the coating would soften! Tried these tonight with blt wraps. Omg sooo yuummy… may have taken a little extra healthy factor out and added some bacon grease for cooking… delicious!! curious as to what the dip is made out of ? What a unique way to prepare avacados! It makes my mouth water! I love avocados! I am making this tomorrow!